Spinach is a flowering plant native to central and western Asia. Its leaves can be eaten as a vegetable and are a rich source of vitamins, iron, calcium and dietary fiber. 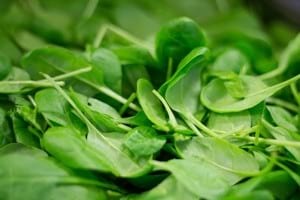 In contrary to most vegetables, spinach has relatively high levels of oxalic acid. When fed in large quantities, the salts of oxalic acid can accumulate in the system and cause toxicity over time. This doesn’t mean we advise to completely ban spinach from your bunny’s diet. Given it is also a good source of nutrients and fiber, we recommend to feed spinach from time to time in combination with other greens. Take care to not combine with greens that are also high on oxalic acids such as parsley, mustard greens, and clover. When picking spinach, select the lighter looking leaves as darker leaves indicate higher levels of oxalates. As far as portions are concerned, limit to 1/3 of the daily fresh vegetables intake. Clean by giving a good rinse under running water and feel free to serve wet to help with the daily water intake. Conclusion: rabbits can eat spinach but make sure to not combine with other greens high on oxalates and rotate frequently. Do you feed your bunny spinach from time to time? Feel free to share your experience.